The restaurant is not big, probably has no more than sixty seats. 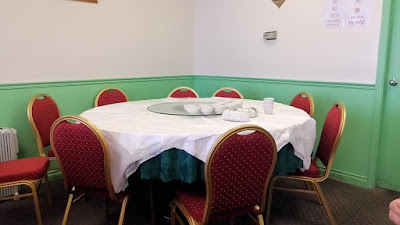 The green and white walls along with the red and gold chairs made the whole place outdated. The plastic one-time use tablecloths, chipped/faded/stained dishware, uneven chopsticks and mismatched cutlery reminded us of those Chinatown restaurants in many foreign cities around the world. Now to the food. 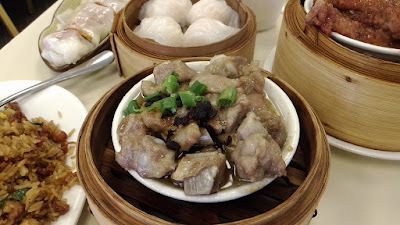 The Steamed Spareribs in Black Bean Sauce 豉汁蒸排骨 was a good bang for the buck. The meaty ribs had a tender crunch but didn't have much cartilages. The sauce was salty and could have used more garlic and black bean. The Pork Dumplings with Tobiko 飛魚子燒賣皇 (aka. 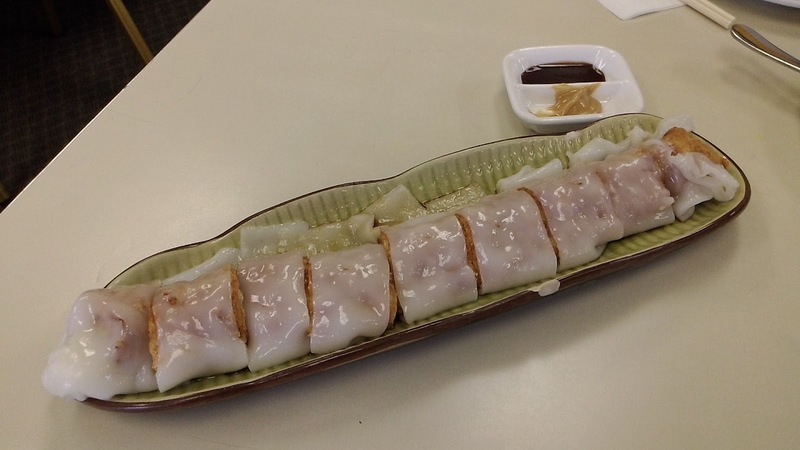 shui-mai) was a huge disappointment. 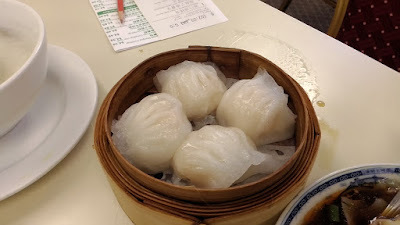 The dumplings were huge, but were mostly fat with poor quality mushy shrimps. 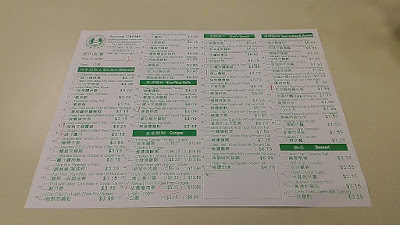 I asked Buddha Boy which was worse, these or the ones at Western Lake Chinese Seafood Restaurant 西湖海鮮酒家 (the worst dim sum joint on our list), Buddha Boy responded, "Equally bad." 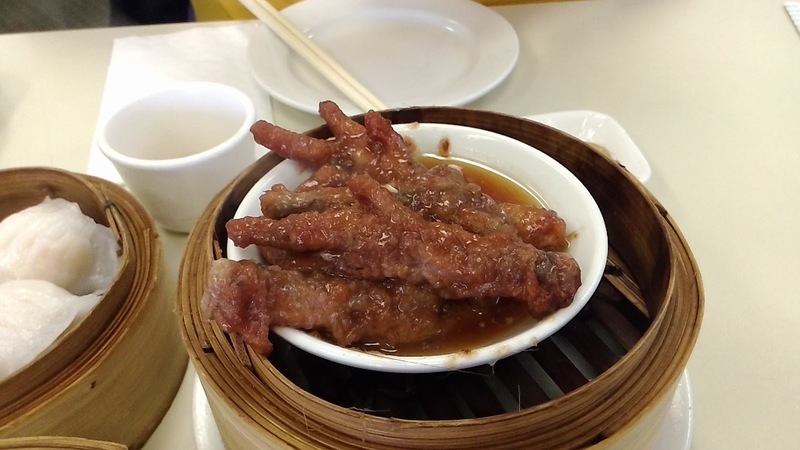 The Chicken Claws in Black Bean Sauce 豉汁鳳爪 has always been Buddha Boy's favorite...but not so much this time. The feet had that bad oil taste. The taste was so vigorous that even after being steamed with black bean sauce, the bad oil was still quite intense. The sauce was salty and not so much taste of black bean. 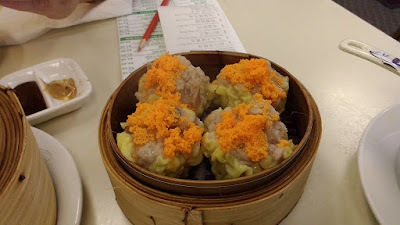 The Crystal Prawn Dumplings 水晶蝦餃 (aka. har-gow) were overcooked which resulted in loose, flimsy and easily broken skin. The shrimp filling was under-seasoned and had no crunch nor snap. Sad to experience another dim sum staple ended in disappointment. While not classic nor traditional, I have always like their version of Spicy Chili Wonton 紅油抄手. 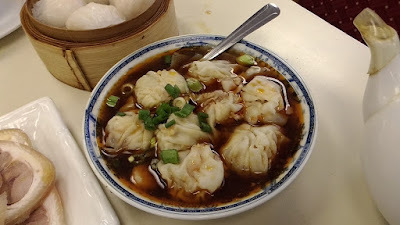 The wontons were placed in a bath of house blend mix of soy sauce, vinegar, chilli oil, sugar, garlic and green onions. 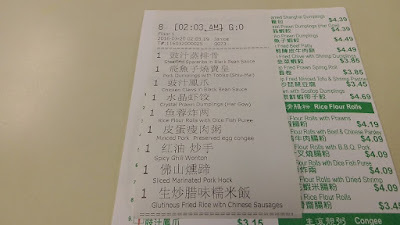 The sauce was salty and had more sweetness than spiciness. The mildly seasoned filling consisted of pork and shrimp. The wontons were wrapped firmly. 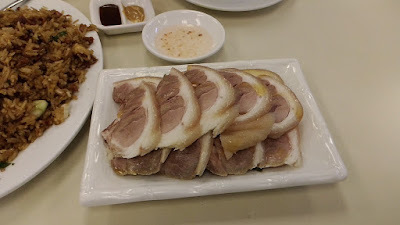 The Sliced Marinated Pork Hock 佛山燻蹄 was weak. The hock slices were bland, perhaps the hock was not soaked long enough in the brine? The chewy and firm texture was a bit difficult to break the bite. The bed of carrots/daikon below the meat was more enjoyable than the hock. 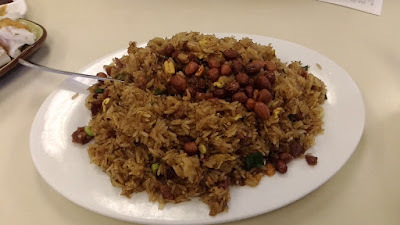 The Glutinous Fried Rice with Chinese Sausages 生炒糯米飯 was another must order for us whenever we visit this ma-n'-pa restaurant. Yes, we were satisfied, but we did notice the decrease in ingredients. The glutinous rice were not cooked from raw (生炒), since that would take way too long. 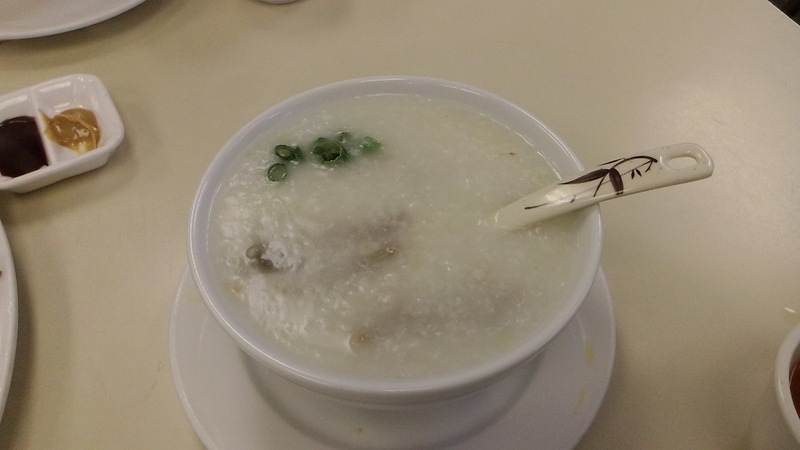 The rice maintained its soft yet chewy texture. Soft tones of soy sauce and sesame oil covered each grain of sticky rice. 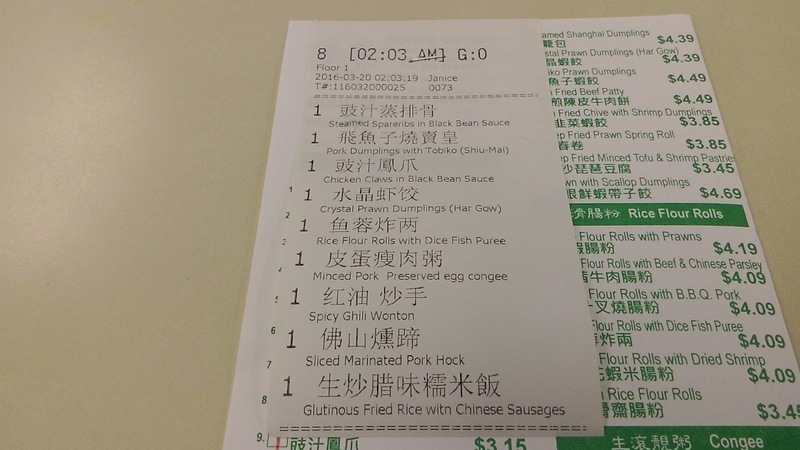 The dish had more than usual amount of peanuts and less than usual amounts of Chinese sausages. What was lacking in flavor was the dried shrimp, which was quite minimal in the dish. After our meal, as we were walking toward our car, Buddha Boy commented, "I don't think we will be back anytime soon. It's bad." Yes, we were disappointed. This joint was once the top on our list for dim sum. Unfortunately, after this visit, we are not so sure when we will visit again. 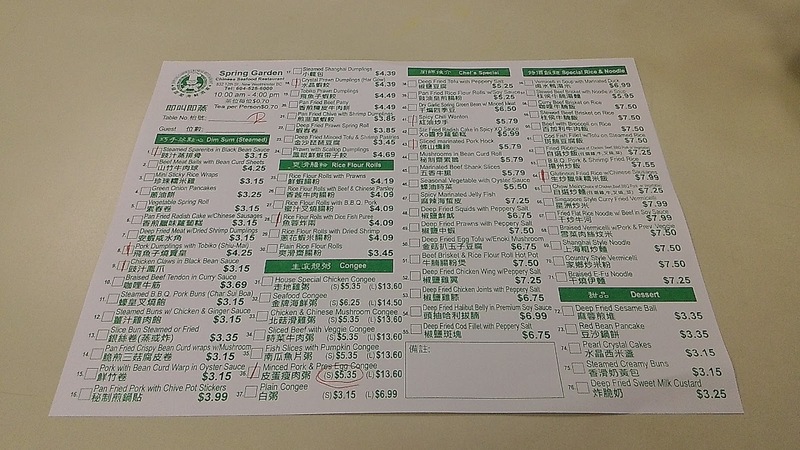 Over the years, their dim sum prices didn't change or increase much, and that could result in a compromise in quality.